This is me at IM Arizona after getting a flat while winning the race. Sport is difficult; it requires time, patience, a strong mind, and a sense of humor. The greatest challenge in sport comes from the fickleness that accompanies it, the fact that in a mere moment things can drastically change from good to bad. A triathlete can go from winning a race to getting stuck on the side of the road with a flat tire. A football team winning by 3 touchdowns at the half can still lose the game. Endurance sports are notorious harbingers of havoc. Post-race, stories are rampant with accounts of races gone awry. As a seasoned marathon veteran, I know how marathons can unfold; and so, 20 years after my first marathon (Chicago, 1993), I still have a very healthy respect for the distance. I am acutely aware as one’s time goals get faster, you must race harder, take more risks, and thus, the potential for failure is even greater. Since I am not afraid to fail, I often go down in flames. Coming in to this race, my biggest concern was my Achilles/calves. I was lucky enough to have a quick recovery from the tear I incurred in August. With some concerted treatment and several weeks of Alter G running, four weeks after the initial injury, I was back on track. Regular treatment, stretching, and strengthening actually helped my calves so much I felt they were healthier than they had been all summer. I also wore compression socks 24/7, which often meant walking around looking like a poser when I wore shorts on the hot days. Or, perhaps, I am on the precipice of a fashion trend that will someday become main stream. My race day plan was to hold 6:05 pace, which I successfully ran through mile 21. Everything felt comfortable – my breathing was relaxed, my form felt good – I was biding my time until mile 20 where I planned to get aggressive and tackle the hilly, last 10k with vigor. I went through 20 miles at 2:02, a solid 2:40 pace. I was feeling encouraged that the race was unfolding according to plan. And then, BAM. Just like that, I got the dizzies. It hit me so hard and so fast, I was shocked. I started to push the Salt Stick tablets and drink more water, but the dizzies got worse. I found myself staggering along the course, weaving from one side of the road to the next. I was whimpering as I ran up the hills, and all I wanted to do was lie down on the pavement and nap it out. At mile 24 I was uncertain that I would actually make it to the finish line. The dizziness was overwhelming and the desire to stop was getting stronger with every passing step. It was very difficult to see my goals disintegrate minute by minute and to get passed and passed and passed by my competitors. Running with the dizzies — I am not too happy! Why didn’t I stop? One simple reason. I am going to Kona to watch four of the athletes I coach embark on a brutal 140.6 mile journey through unforgiving terrain in a spectacle known as the Ironman World Championships. I came to the conclusion that I needed to set an example for them – finish what you start even when your goals go out the window. My inspiration came from their hard work and the desire to send them a message: Be strong even when you are feeling weak. 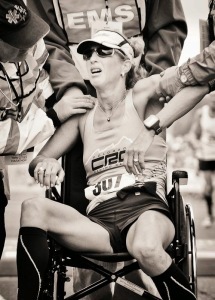 When I crossed the finish line, I immediately collapsed. The absolute worst thing you can do when you have the dizzies is to stop moving. So, naturally, when I stopped moving, I could no longer stand. It made for quite a dramatic finish and a trip to the medical tent for the first time in 5 years. In honor of upcoming Hawaii Ironman, this is me after finishing Kona in 1999 with the dizzies. A running medical tent is very different from a triathlon medical tent. The biggest distinction? They are incredibly stingy with IV drips in the running med tents. When I came in, barely coherent, the first they did was start pushing water or food or Power Ade. Then, they decided I needed broth. I think there must’ve been a contest among the doctors to see who could off load the most broth, because they were handing it out to everyone unfortunate enough to be in there. It was disgusting. It was thick and lukewarm and I had to drink this sludge through a straw. They really need a Top Chef to work on the recipe. Surely, there must be a way to make bullion tastier. When I realized it was this broth or nothing, I gagged it down and an hour later I was on my merry way. In hindsight, I believe the dizzies came on from the spacing of the aid stations during the first 20 miles of the race. The aid stations were every 2.5 miles, not nearly enough, even on a cool day. I just need more liquid. Plain and simple. I’m not sure which marathon I will run next, but one thing is certain. I will be carrying a water bottle with me. We are looking for people to Join the 15th Annual Team Spirit Long Beach 5k and 10K marathon and help put an end to breast and ovarian cancer today!. You can help distribute brochures and yard signs to local stores, offices, and restaurants! Are you a people person? We have many community events where Team Spirit needs a presence. Volunteer to work a table at one of these events to hand out brochures and spread information about Team Spirit, and recruit participants! Already attending the marathon? Then help volunteer the day of the event. We need groups to assist with set up, participant check-in, new registrations, and drive or co-pilot shuttle vans. We will also need people to man water stations, and course monitors to assure participants’ safety and morale. 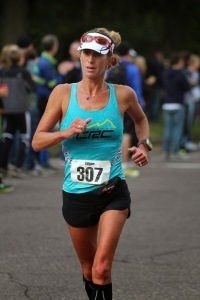 Previous story Do Professional Runners/Triathletes Matter?